Comics Continuum have post five-page previews for next week’s released by IDW, which includes issue five of John Byrne's Crew series. 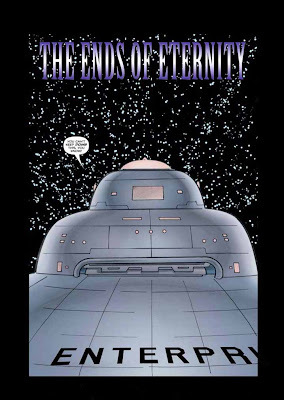 Which gives the title "The Ends of Eternity". See the other pages, here. Though I'm afraid Early Voyages fans Mr Byrne has still not had a look at other adventures of the Enterprise under Pike it seems; Spock on the enterprise before Pike took command, shocking!